In this post: If you’re looking for dining room inspiration ideas to create a welcoming room to entertain in, consider adding a rosy glow with blush pink. The room had a lot to offer but the dark paint was not our style and the modern wall mirrors didn’t work for us either. 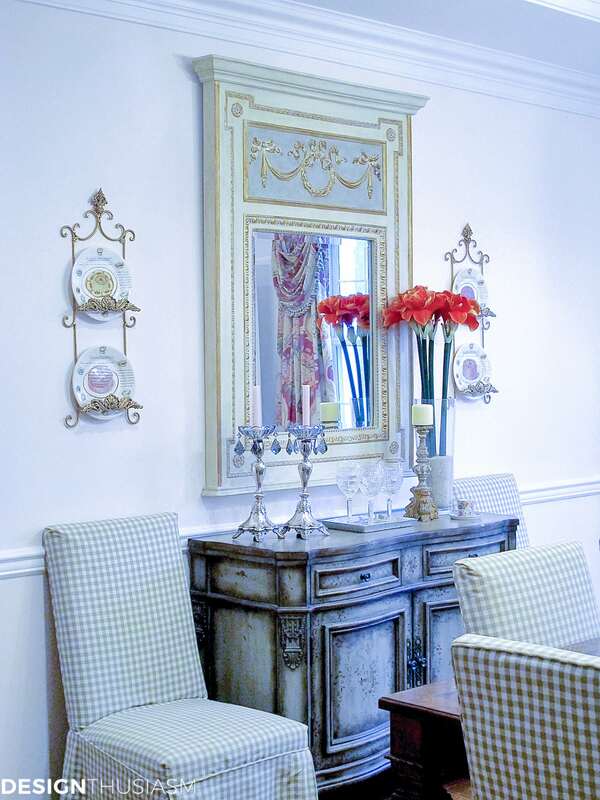 Our painted sideboard and trumeau mirror were often the focus in our old dining room and I’ve kept the styling as before, but only as a starting point from which to move forward. Given that my aesthetic really hasn’t changed, I see much of my decorating in the new house as an opportunity to fix some of the imperfections I wasn’t happy with before. In this room that began with the paint color on the walls and I chose a blush tone that gives a rosy glow, warmer and less of an actual pink than we had in the other house. The color is Benjamin Moore Bridal Pink. The plate racks were in our breakfast room before, but the larger room has a greater expanse of wall and enough space to accommodate our spare chairs. 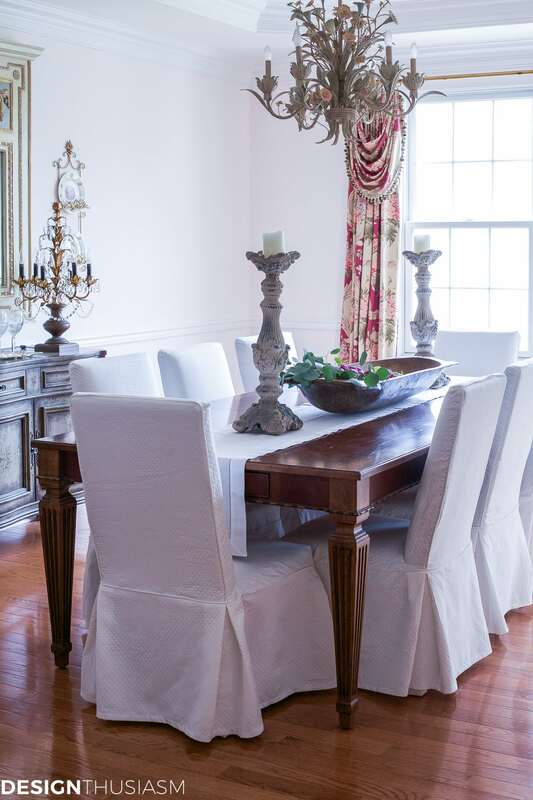 The ivory painted china cabinet was a key piece in our old dining room, but it never photographed well in the space it inhabited and hence was rarely featured in any of my posts. It will take some time to get the lighting right for photographing this room, but I’m already happier with the warmer glow that envelops the space. Another piece I rarely highlighted is this moss colored cabinet that houses much of my tableware. I’ve often been asked where I keep all of my dishes and the accessories that I use in my table settings, and these two pieces do much of the heavy lifting in that realm. I’ve toyed with painting this cabinet a lighter color and welcome comments about what you think might look good for this piece. The glass apothecary jars are not meant to be staying there, and are only up on top waiting for a better place to go. Our dining room table and chairs are exactly the same, but have mostly been featured with a full table setting on top. 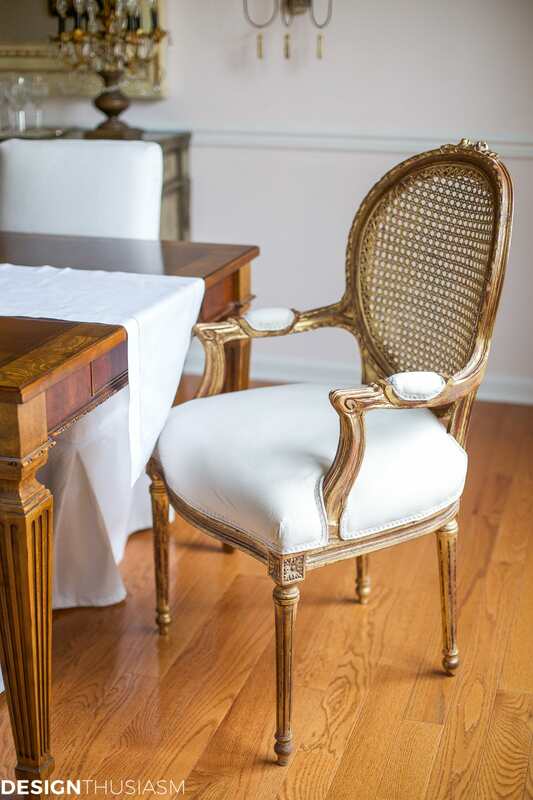 I always intended to add a pair of French chairs at the ends of the table, and hopefully that will happen some time in the future. This table gets a lot of use, so I keep it with one of the leaves in, but there is another that can be added if it needs to go larger. I love to display my favorite tabletop pieces in the china cabinet, as they are easy to grab and work with the rosy feel of the room. 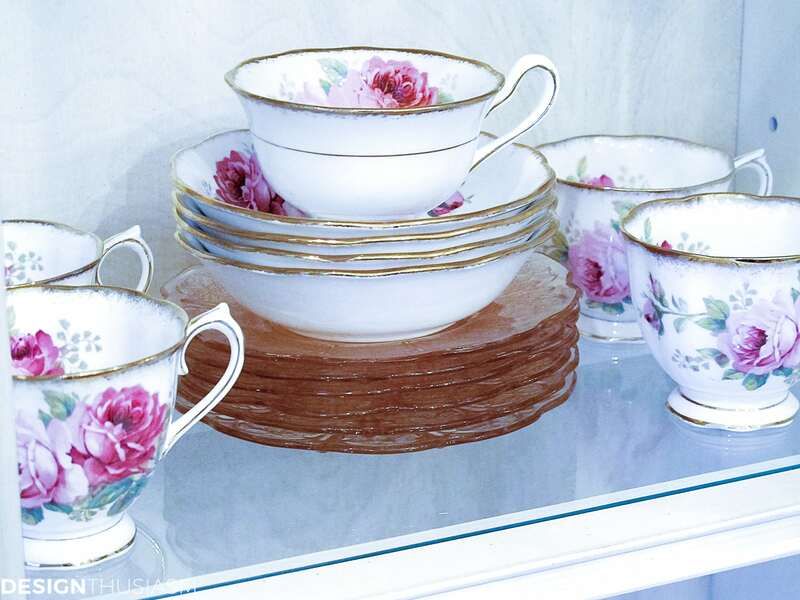 Here is part of my Royal Albert American Beauty china collection, mixed with lovely pink depression glass plates. I enjoy the symmetry of the room and the view overlooking the greenery outside. In our old house our large picture window was off center in the room and looked out onto the smallest part of our odd shaped yard. 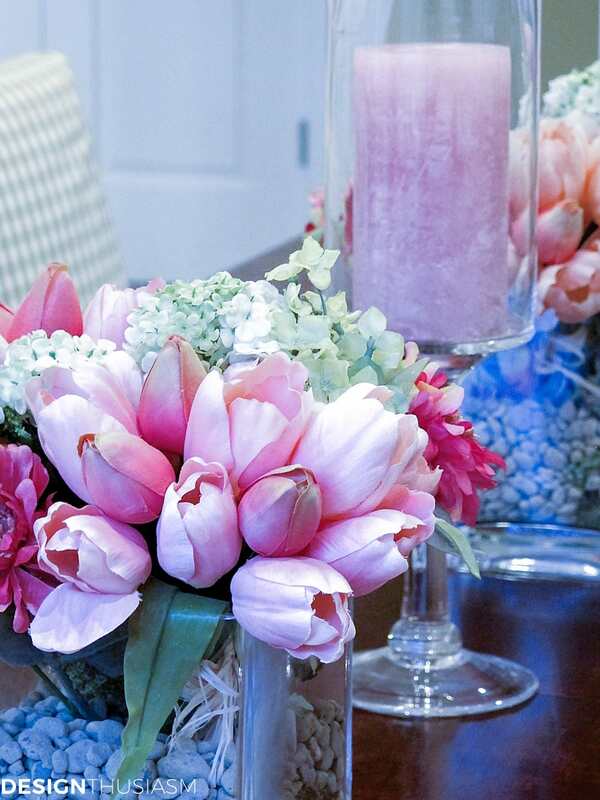 For everyday use, I keep faux florals on the table, but when I serve in this room, I prefer to get fresh flowers instead. The drapery panels were moved from our old living room and help add to the rosy feel of the space. 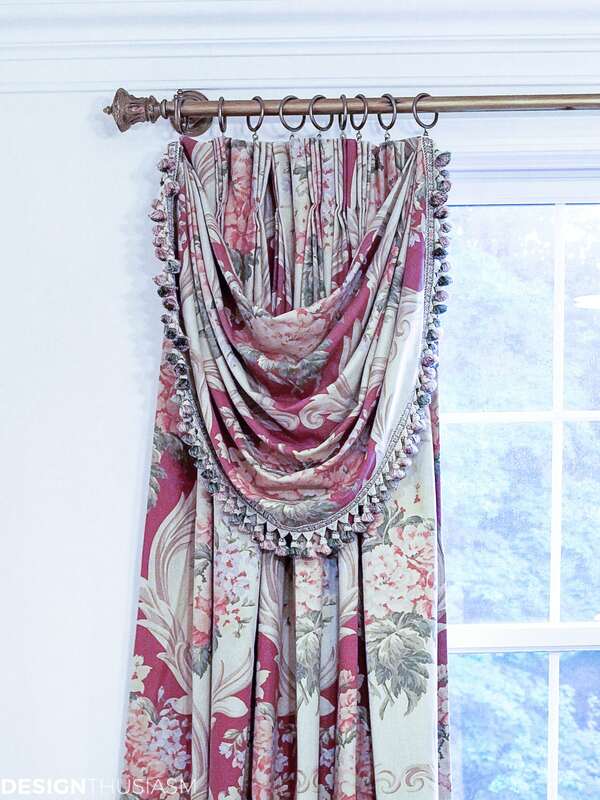 The pattern is Ralph Lauren’s Knightsbridge Floral which has unfortunately been discontinued. 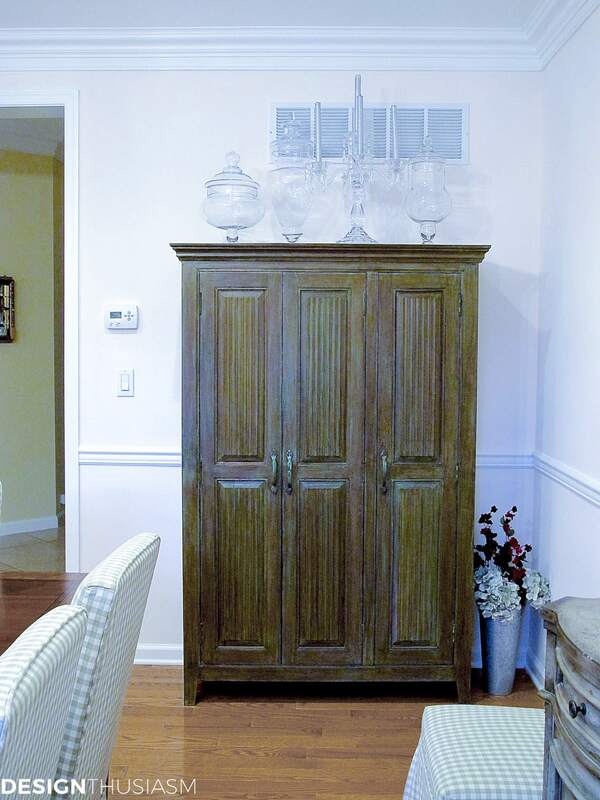 My passion for china collecting was beginning to max out our space in the old house, but next to our new dining room we have the perfect spot to add a butler’s pantry for more storage. That’s a project you’ll be seeing more about in the upcoming months. 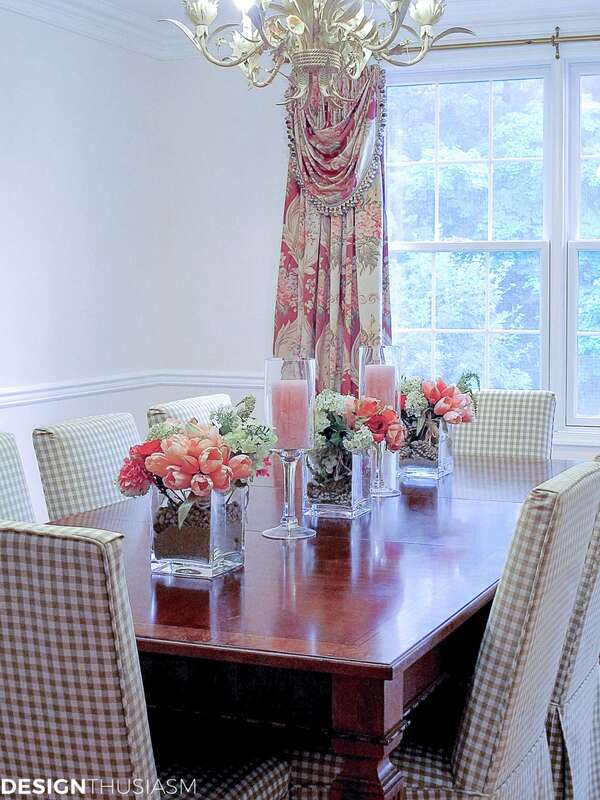 I’ve already held my first dinner party here and that table setting will be upcoming. I was delighted to have the room functioning so well for my guests! Stunning, everything is absolutely stunning. Can’t wait to see more as you get things done. Thanks tons for linking to Inspire Me. Thank you so much, Marty!! Always a pleasure to link up with you… 🙂 Looking forward to sharing more too!! This is beautiful! If you really want to change the moss cabinet what about doing something like the mirror or the piece under it? I think it looks fine but I too enjoy change sometimes. Again this is lovely thanks for sharing. The scene out your window looks so beautiful that it reminds me of backdrops movies or photographers will use in their work…and you have the real thing everyday. 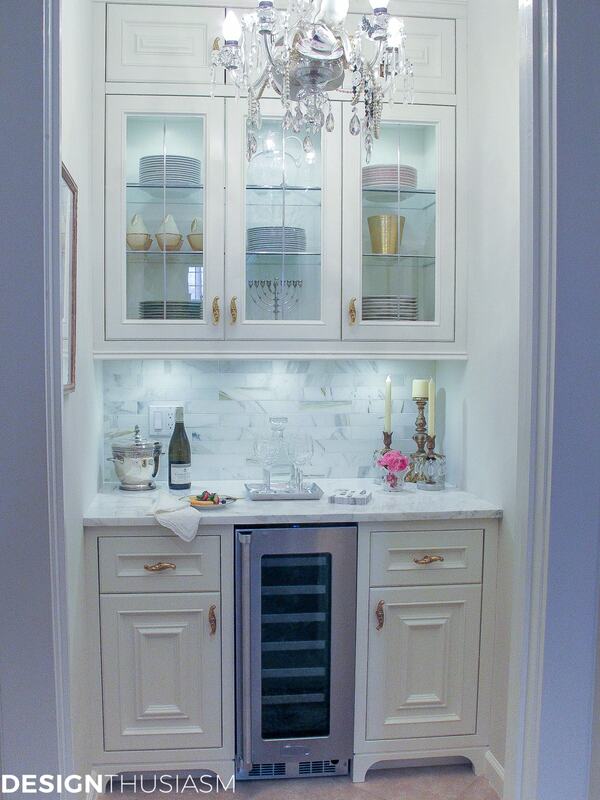 Love that your have a door leading to your kitchen…always a nice and rare feature. Looking forward to future reveals. Wow! So beautiful and elegant Lory! 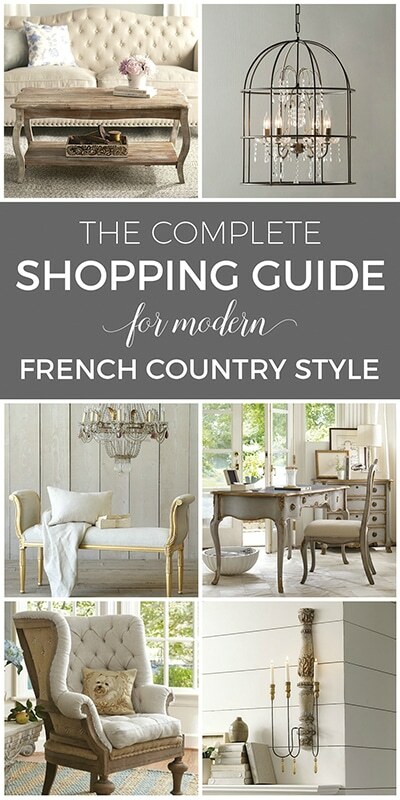 I think your mix of casual, formal and the French elements make a totally cohesive design. It is all so pretty. I especially love the blush pink walls! Very warm and inviting Lory. I can not tell the color of the ceiling, but would love to know. Thanks, Pat!! The ceiling, as well as all the trim in the house is Benjamin Moore Simply White. It’s pretty close to an optic white with just a touch of warmth to it. 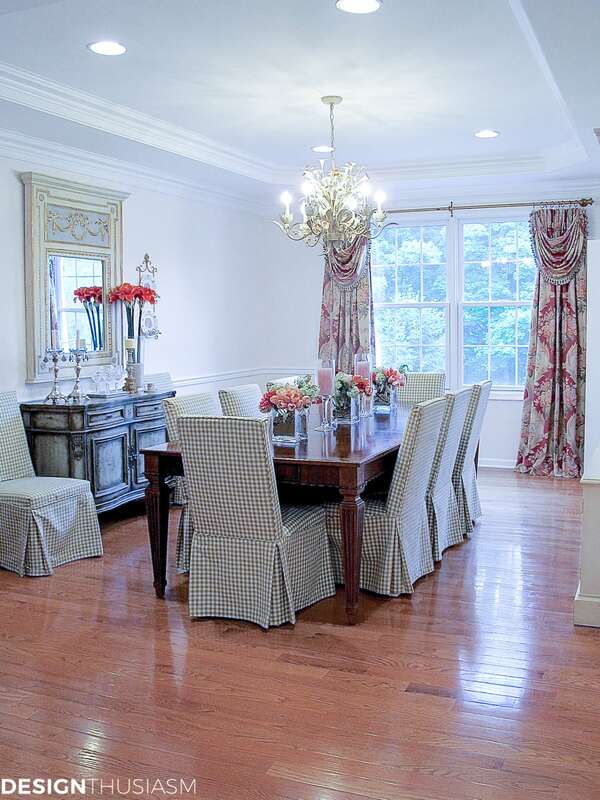 Lori, I love, love, love your new dining room! That wall color is fantastic. 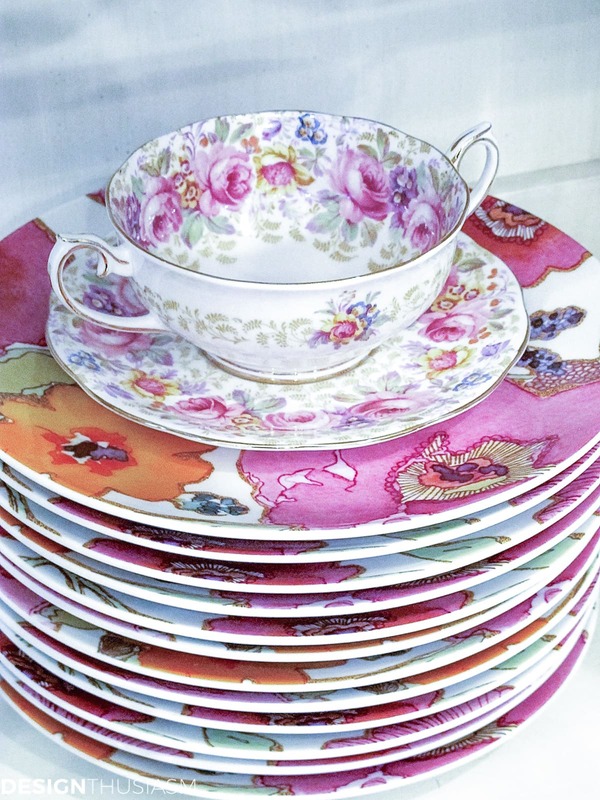 Once again, the Royal Albert cups and saucers are so beautiful! I love seeing your things in a new setting. You are right that a big crystal chandelier would be gorgeous in this space, but this one looks beautiful, too. Thank you so much!! It is fascinating to see how different the same pieces look in a new setting. It’s like buying new things without the expense! Lol. But there’s also plenty new coming… 😉 And yes, so looking forward to a new chandy, but that will be further down the road. Keep having to remind myself Rome wasn’t built in a day! I just know you are having a ball decorating your new home, which looks lovely. Can’t wait for all the other reveals. Lory, I love your plate holders! I have been searching for so long looking for pretty ones like yours. Would you mind sharing where you found them–I would appreciate the help so much. Best wishes for many happy memory making days in your new home. Thank you, Bobbi! And yes, definitely enjoying the decorating… 🙂 The plate holders I found online – just kept searching until I found the style I liked – then painted them gold (they were a darker color – a brownish black). I tend to walk around my house painting everything gold… lol! If I can find the link, will come back and post it here, but I think there were several places that had them. It’s absolutely gorgeous Lory. I can’t believe you’ve only been there a month!! Enjoy it! Thanks, Kim! It’s actually driving me crazy that there’s so much more to do, but in truth we are pretty settled for being here such a short time… 🙂 So glad you stopped by and took the time to comment! 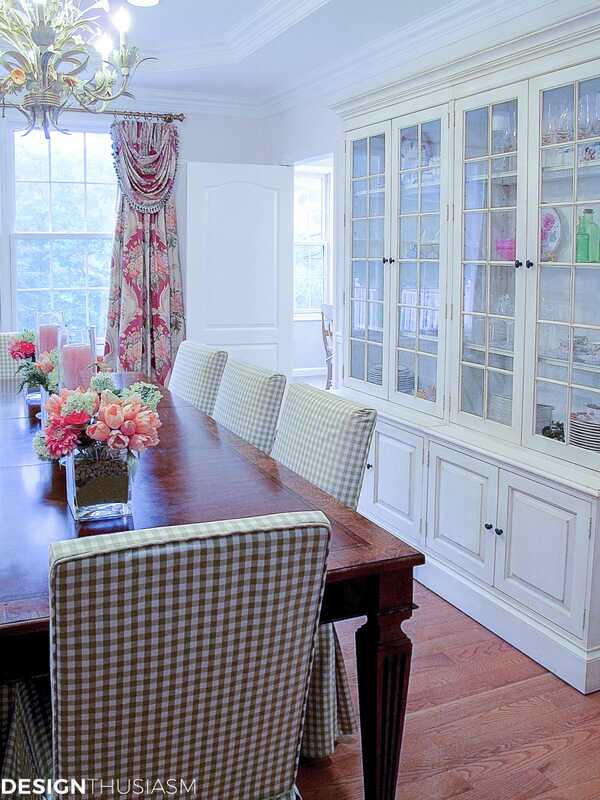 I love the room your painted china cabinet is wonderful in this space. I would paint the green cupboard to match one of the two painted pieces you have in the room. Either one of would look nice on that piece. I wouldn’t pick another paint color simply because you already have the two different painted pieces. Thanks, and I agree. 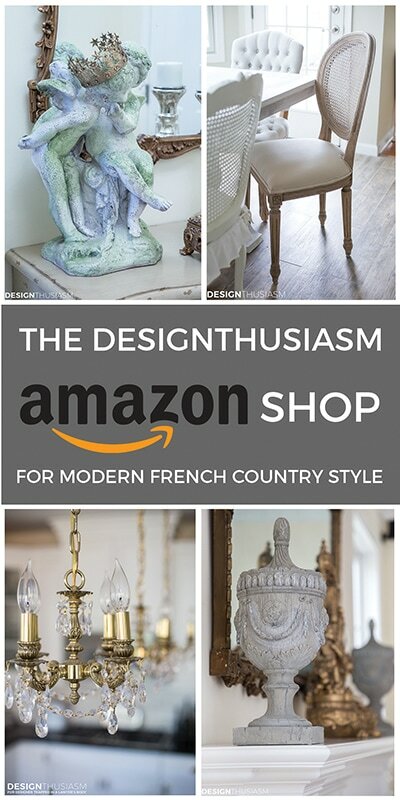 I’m thinking an antiqued cream, which is the lighter part of the sideboard and similar to the china cabinet… 🙂 Thanks so much for visiting and taking the time to comment! What a lovely room! So elegant! Ahhhhhhh an absolutely beautiful room…amazingly beautiful in fact!!!! You have done wonders for only being there a month…my hat is officially off to you! If there were anything at all that I would change (I really had to hunt for something though :^), I would paint the return air vent above your cabinet, to match the wall. I think the glass jars look lovely there by the way! Lory, this room is beautiful. I love the wall color and your pretty furnishings and accessories with it. 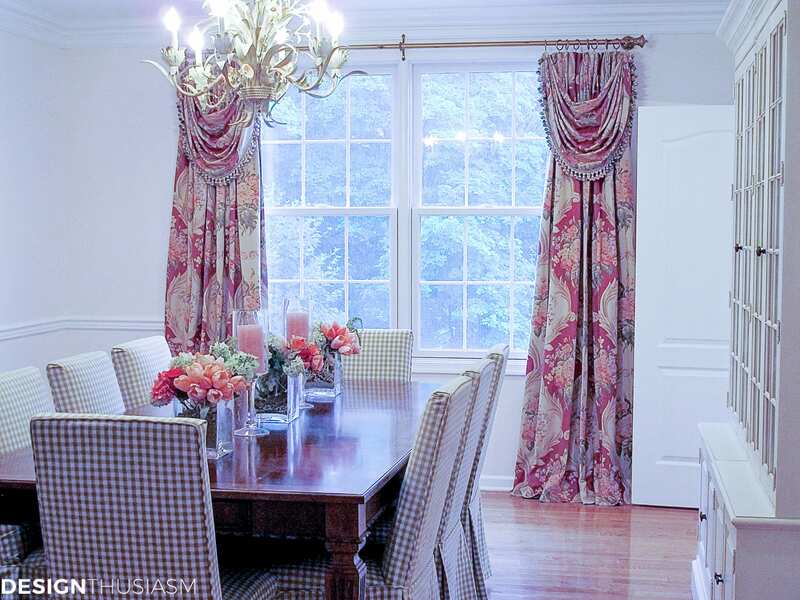 Hi Lori, your dining room is stunning! I am already inspired:) I would love it if you would share your creativity at the Friday Favorites Link Party, happening every Friday at Mustlovehome.com! Absolutely gorgeous! 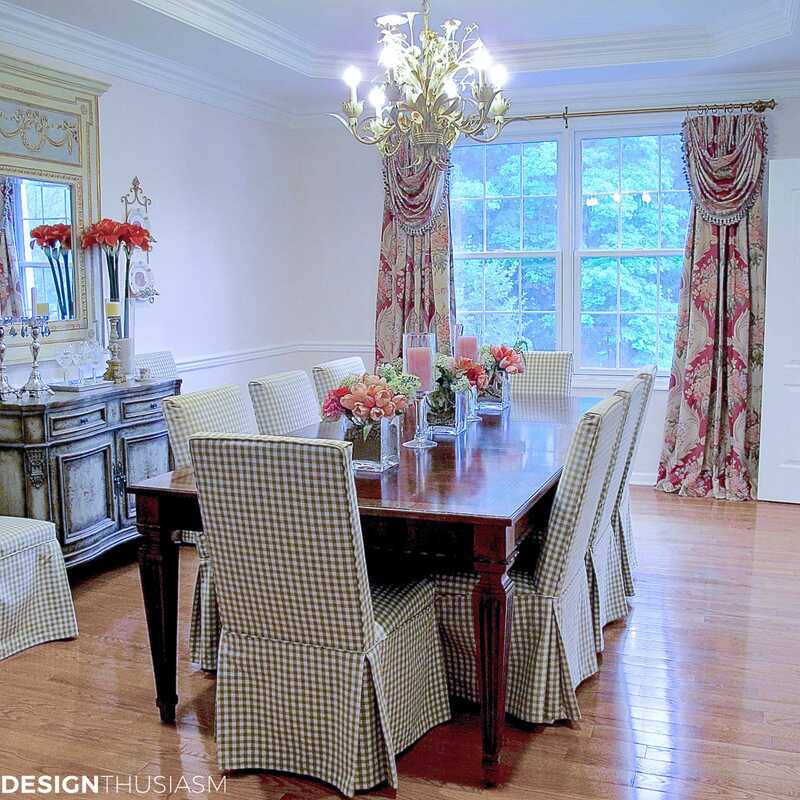 That china cabinet is amazing and those drapes make me swoon. I wouldn’t say that you need to change anything in that room at all. 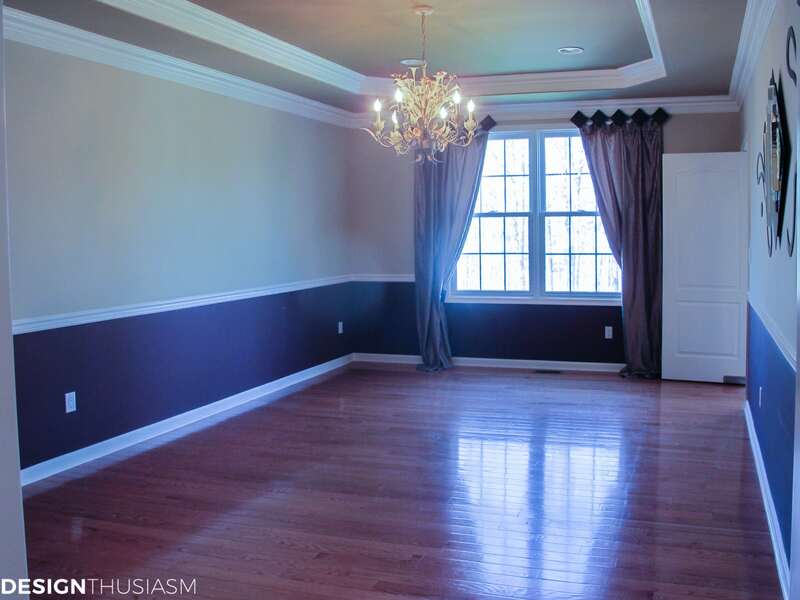 Love the “after”…you created a beautiful space! Love the check fabric on your chairs. Lovely, lovely, beautiful! What a fantastic house you moved into! Really looking forward to seeing more. Thanks so much!! It really is fun working on the new house, because we brought with us many pieces that we’ve collected over the years, but also have the opportunity to correct the mistakes we’ve made in the past… 🙂 It’s easy to make the smaller changes because we don’t have to spend on the big items. 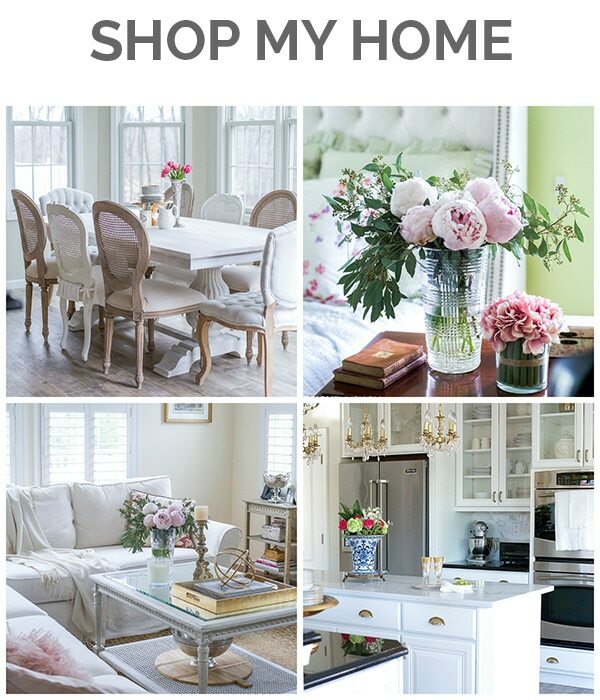 Your ability to bring your items from your old home and recreate such a gorgeous room is a talent that I greatly admire. Your dining room is very lovely with only one item amiss. The moss cupboard overpowers the wonderful room that you have designed. I look forward to viewing and enjoying more of your projects. I think your butler’s pantry is a china collector’s dream. 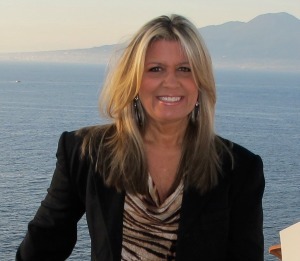 I am an antique dealer and often do tablescapes for charity events. I envision a massive china closet in my dreams. You are truly an inspiration. 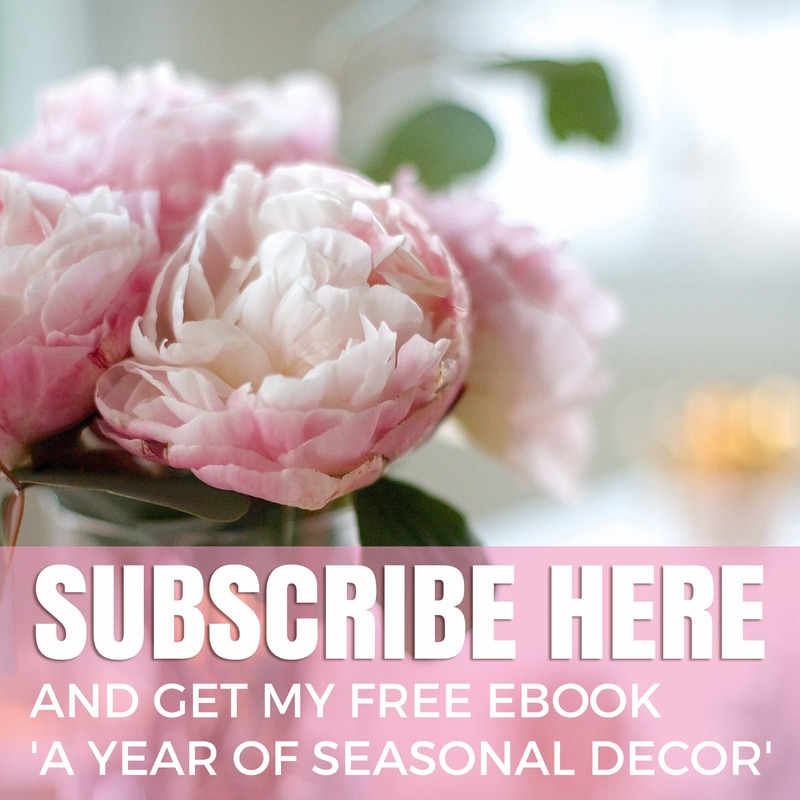 Lory, I am new to your blog and I am in heaven! I think your dining room is just stunning and so much in the lines of my own taste in decorating. I am nearly overtaken with china, which is also a passion for me. I love beautiful tablescpes, and have learned so much from you already. I can’t wait to see your post about your first dinner party in your new home! Thanks so much, Martha!! And welcome… 🙂 Take your time and look around. Love having like minded people here! !